I have not written for a long while, simply because physically and mentally I have not been in a good space. Life, with all its challenges is busy taking its toll on me. However, let me fill you in about my recent hospital visit. I was put on new medication (oxpola) which resulted in me having a number of hallucinations / seizures during the night. On one occasion, I must have hit the lamp / bed pedastal / wall with my hand and when I woke up, I found my left ring finger hanging in a floppy position. 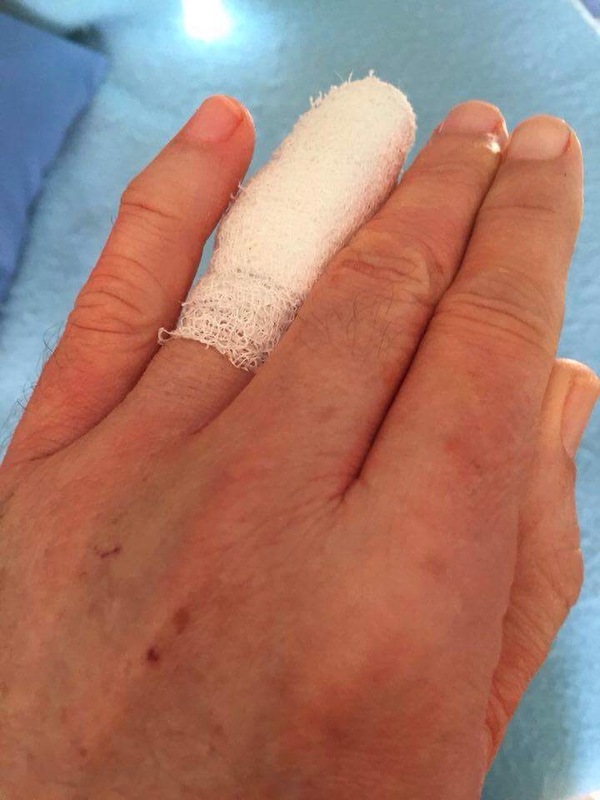 The tendon had snapped and the doctor recommended a brace for the finger, hoping that it would repair itself. Despite wearing the the brace for two months, there was no healing. So, last week I visited the specialist and, after having taken X-rays, he suggested surgery. I thought it was like trying to fix the ear on a China cup that had cracked up but he thought it was the right thing to do. Request for Medical aid authorization followed. – the difficult part. Then, Monday at noon, I was admitted to St Georges Hospital and operated on at 14h00. The tendon has been found and reattached and the finger is wired up and bandaged for 6 weeks. I was discharged on Tuesday morning and will have to see an occupational therapist today. The main news this morning reflects on the possible bankruptcy of GEMS, our medical aid. I hope there is money in the pot to remove the wire in six weeks time! OMG, another visit to the hospital! So, in the grand scheme of things, it’s not really major surgery – just a nuisance factor! It has also put the spotlight on the state of our ever-declining standards in our hospitals. The state of our nursing standards certainly leaves a lot to be desired. Too many patients and too few dedicated nurses to do the work. Here’s hoping the operation was a success and that in six weeks time, all will be fine. On Friday night we will attend Tommo’s concert for cancer at the Old Grey Club. This will be his retirement concert and should be a good night’s entertainment. There are still tickets available from Wendy Beaufort on 0823752168.